Earlier in the week, Kevin gave some tips for improving your travel photography. I wanted to share this photo that my friend, Layal, took a few weeks ago when I was visiting her in Los Angeles. 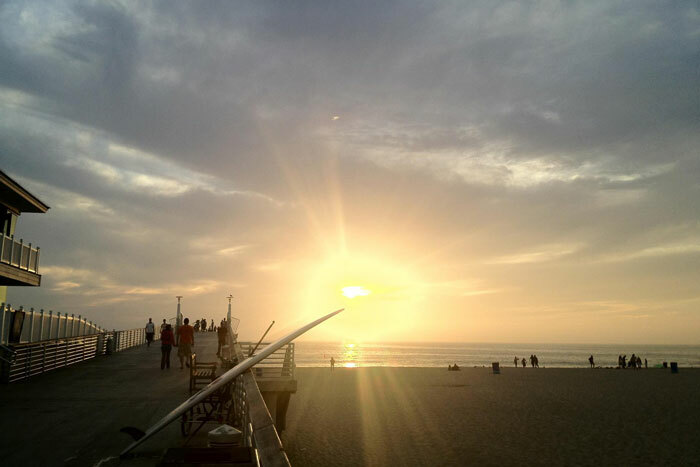 We spent the day doing a little road trip along the LA South Bay coast, ending with sunset and dinner in Hermosa Beach. She used her iphone 4 to take this photo along with the built in HDR setting. She composed it perfectly in-camera using the rule of thirds (with the horizon at the lower vertical third and the surfboard at the left horizontal third). Great work, Layal!